How Do You Maintain a Commercial Roof? How Much Does Roof Maintenance Cost? Repairing or replacing a roof can be expensive. Nationally, the average homeowner might pay over seven thousand dollars to install a new roof, and most homeowners in the United States spend between $5,206-$10,130. Repairing a roof costs significantly less, but it will depend on the material your roof is made with. The average cost for minor roof repairs ranges from two to three hundred dollars. Basic roof maintenance incorporates the cost of minor repairs, thus a property owner should budget approximately three hundred dollars a year, give or take, since some years, you might not need any repairs, and some years you might need a rather large investment in the life of your roof. One of the best ways to prolong the life of your commercial roof is through commercial roof repair. Usually a full scale replacement of your commercial roof is not necessary when only a minor repair is needed. Minor roof repairs, when administered promptly, can prolong the life of your roof. Another way to prolong the life of your roof is through commercial roof washing. Many professional roofing companies perform this service. 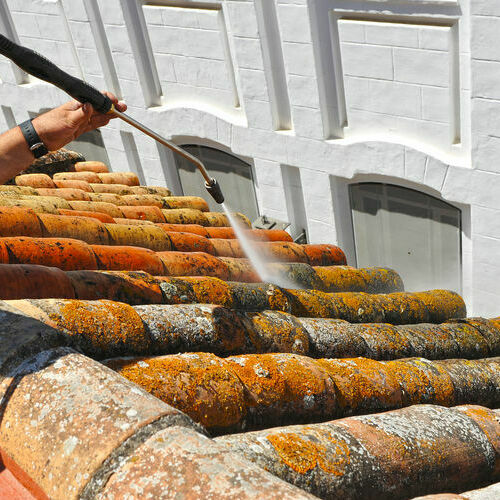 Usually commercial roof washing involves either a hydro pressure wash, or an alternative method called ‘soft-cleaning.’ Soft cleaning involves chemicals. Prolonging the life of your roof is important. Home improvement projects like routine roof maintenance and hanging curtains are important. But how important is it to improve indoor air quality? You will need to factor in a priority list for your DIY project. Knowing when your roof needs to be replaced is an important part of the last cycle of your roof’s life. There are times when a roof needs to be replaced despite there not being a large roof failure, which is actually a blessing in disguise. If your roof looks ragged, and with the advice of your roofing contractor, has lost much of its effectiveness, it’s probably a good time to replace your roof. Every property owner should have a highly functioning roof. 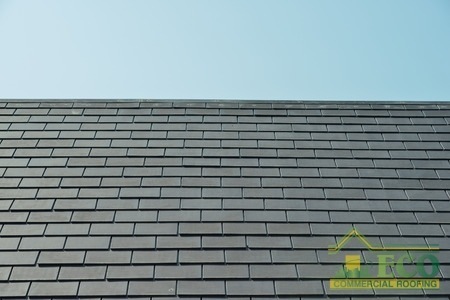 If you have an asphalt shingle roof for your business, signs that you should get a new roof include curled shingle edges, cracked shingles, dark streaks, and finally, roof leaks. For commercial metal roofs and rubber roofs, signs of deterioration, disrepair, rust around flashing, and leaks are indicators. How Much Does a Commercial Roof Inspection Cost? As with many if not all roofing services, the material the roof is made of will determine the overall cost. Size, style, and location of the building all factor in. Some roofers offer free roof inspections, while others must be compensated for their time. 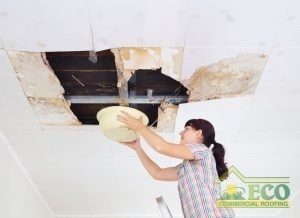 If the roof on your property is leaking, it’s time to call in a professional. Roofing leaks only get worse due to the accumulated pressure of rain water and gravity in a small opening. You will be able to tell if your roof is leaking due to a variety of ensuing signs. In the area of the roof leak, you may see a dry or wet dark water stain. The presence of water will either be immediately or latently available depending on whether it is raining outside. Roof maintenance is integral to the performance of your commercial roof. One of the ways you can provide maintenance for your roof is by clearing debris with a leaf blower or a broom. Trim any tree branches which may be close to your roof, as they likely will end up on your roof in one way or another. If snow impacts your area of the world, make sure that when the snow gets heavy — say a foot or more — carefully pull the snow off the roof with a snow rake. Snow rakes are available at most home improvement stores. Missing, damaged or curling shingles. Signs of algae or fungus. Examine the flashing around your roof vents to ensure that it is remaining intact. If not, it will need to be resealed. Roof inspections go a long way toward accomplishing basic maintenance for your commercial roofs. You can schedule regular cleanings with your local, trusted professional roofing company, and thus become notified when there is the need for minor repair. Your professional roofing company will best know how to maintain and service your roof depending on the weather and climate of the area, and hopefully administer high quality materials and services for your commercial property. Prolonging the life of your roof will save you time and money in the long run. By accomplishing basic tasks like regularly removing dirt and debris, either through the use of a professional roofing company or on your own, you can extend the life of your roof ten or twenty years. (833) 200-0571. Discover more about what roof maintenance in Texas, Louisiana, and Mississippi, TX can do for you! Posted in Uncategorized on April 10, 2019 at 9:29 pm by ECO Roofing. Which Flat Roof System Is The Best? Flat Roofs Come In Different Materials To Help You Get The Most Out Of Your Roof. Flat roofs are a hot commodity with commercial buildings but they are also starting to make an appearance on the residential roofing stage. If you are building your new home and are trying to decide which type of roofing system would be best for you, it is worth taking the time to consider the benefits of owning a flat roof. There are several different flat roofing materials that you can choose from. 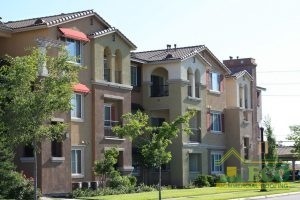 Each of the different types provides their own unique protection for your home or business are suited for different types of environments. No matter what type of flat roof type you go with, the one thing they all have in common is that they are easy to repair. Here is a rundown of the different flat roofing types. Bur roofs, also known as build-up roofs, have been a popular fat roofing style in the United States for 100 years. They have an unmistakable tar mixed with gravel look which is used to help reflect UV light from the sun, avoiding sun damage to the roof. Bur roofs have come a long way from their original conception, as they are now paired with insulation to help make them more energy efficient. Today, they are made with layers of bitumen, ply sheets, and gravel or stones to give the roof its reflective property. The lifespan of a bur roof is comparable to that of an asphalt roof, (which makes sense because the primary material of bitumen is asphalt,) which is about 15-30 years. Proper installation along with regular maintenance can help your roof last til 40 years, but it all depends on you as the homeowner. Bur roofs last better in warmer climates, as colder climates could cause expansion and contraction of the asphalt. This leads to cracks which can lead to leaks. Modified Bitumen roofing, like bur roofs, has asphalt as its primary component. What makes bitumen roofing stand out among the other roofing types is its durability. 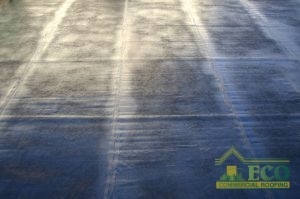 This is due to the fact that the seams of a bitumen roof are melted together during installation, which completely erases them. Without seams, the modified bitumen roofing is practically leak-proof, which is great for areas that experience a lot of rainfall. Modified bitumen roofs also are highly resistant to wind, fire, and impact damage. This makes them perfect for environments that experience severe weather often, allowing them to better protect your home and business. This is because the material doesn’t give in to pressure as easily as other roofing styles. Because of their durability, they have a long warranty and a minimum lifespan of 20 years. EPDM give home and business owners a more environmentally friendly option to flat roofing. Made primarily out of rubber (duh), the roof is mostly made out of recycled materials, helping to reduce the amount of waste in landfills and saving up on natural resources. This type of roof is also great for your wallet, as they are able to reflect heat away from your homeowner business, allowing you to save on your energy bill. During the winter, you won’t have to worry about being cold either, as the rubber acts as an insulator, keeping the heat inside your home or business and not escaping outside. EPDM rubber roofs are also highly durable and boast a lifespan of 30-50 years. Unlike other flat roofing types which struggle with the build-up of water since it doesn’t have anywhere to go, rubber roofs expel water causing it to run off the roof or to quickly become evaporated once the sun comes back out. This helps in the prevention of leaks, which is one of the leading cause of roofs not reaching the end of their lifespan. They are also wind resistant, as the material stretches out and adheres to your roof. Fire is also not a problem, as rubber is naturally a flame retardant. Spray Polyurethane Roofs are one of the easiest types of flat roofing to install, and because so, has a lower installation cost. In fact, this type of roofing can be applied over pre-existing roofs as well, making them a favorite among homeowners and business owners. This is because the material is installed by a spray (hence the name), and then foams to create the actual roof. This allows spray polyurethane roofs to be extremely versatile, fitting to virtually any roof type. The spray and foam technique also allows this flat roofing type to be seamless, allowing it to highly leak resistant as water has a hard time getting underneath the roof. Without the seams, it also produces a roof that is able to keep hot air in during the winter and reflect the UV light from the sun during the summer, keeping your home nice and insulated, which helps cut back on your energy bills. The one thing to keep in mind about spray polyurethane roofs is that they do not fare well against impact damage, making them less than ideal for areas that experience a lot of hail. Flat Roofs Are Easy To Maintain And Repair. Thermoplastic membrane roofing takes the best of EPDM rubber roofing and builds upon it, making for a hardier longer lasting roof. 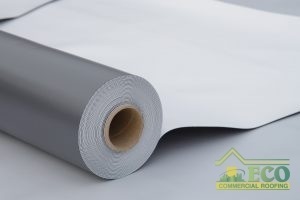 As one of the newer materials on the roofing market, the thermoplastic membrane is a mixture of talc, fiberglass, carbon fiber, wollastonite, and metal oxysulfate. It is one of the cheaper flat roofing options, which is making it more and more popular with home and business owners. It also helps that this particular type of roofing easily fits in with any home style and the beautiful white color of it eye-catching which helps to raise curb-appeal. As with EPDM rubber roofing, thermoplastic membranes are extremely durable having both UV reflective properties and a water-resistant surface. 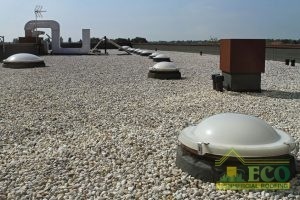 The water resistant and UV reflective properties help the roof be a deterrent for mold and fungus growth, as the materials fail to provide these pests an optimal place to grow. Unlike EPDM rubber roofing, thermoplastic membranes are impact resistant, making them more of an ideal match for those looking for a flat roof that can handle severe storms that produce hail or toss around debris. Compared to other roofing types, such as a pitched roof, flat roofs have their pros and cons that sets them apart from their competitors. A flat roof is one of the more economically and environmentally friendly of the roofing types. Which, with more and more people concerned about both their finances and the environment, this type of roofing serves as a solution to both. They also are easy to repair from damages and most of them have reflective properties which makes them resistant to sun damage. This being said, they usually are not the best when it comes to areas that experience a lot of rainfall, as the flatness of the roof gives water nowhere to go except to pool up. If the roof does not have some kind of relief from the water than it gets to the point where leaks begin to occur, which is one of the biggest problems facing flat roofs. Also, most of them do not have a very high impact resistance, which is not good for areas that experience severe storms. Call Us Today To Get More Information On Flat Roof Installation And Repair. The type of roofing that is best for you depends on the kind of area you are living and what it is that you are looking to gain from your roof. 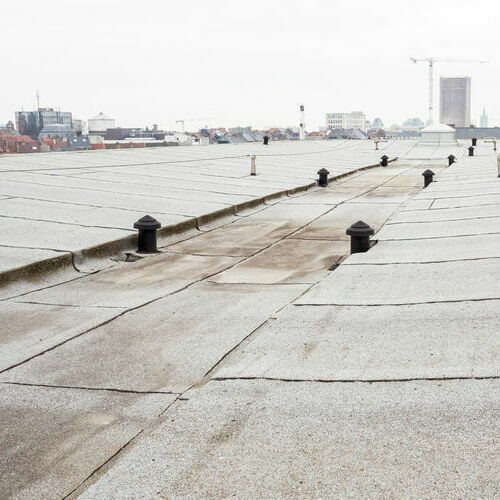 If you need help deciding which type of roof would be best for you, or you need a flat roof repair in Texas, Louisiana, and Mississippi, TX then call the expert team of roofers at ECO Commercial Roofing at (833) 200-0571. Does A Flat Roof Need Gutters? Yes. Gutters need to be pitched in order to allow the water on the roof to safely make its way back to the ground, which can help the roof avoid leaks. Posted in Uncategorized on February 8, 2019 at 8:48 pm by ECO Roofing. 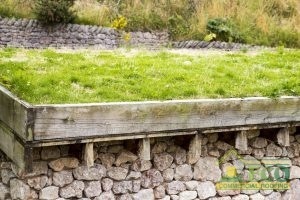 What are Green Roof Systems? 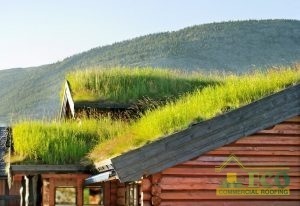 Green Roofing Systems are More Than Just Pleasant to Look at! They Can Save You Money Too. Businesses carefully choose commercial surveillance equipment. They painstakingly plan on interior design and HVAC system installation. But do they always choose the best roofing systems? Not so much. When it comes to selecting an environmentally-friendly, energy-saving roofing system, few solutions can beat the effectiveness of a green roofing systems. Today, we’ll briefly discuss the design behind green roofs, their cost-savings benefits, and why your business should at least consider one of these living roof systems. Afterwards, you should be able to see why so many businesses choose them and why local governments like to offer tax incentives for them. Beneath every beautiful green roof is an intricate, multi-layered system that is designed to be self-sustaining. At the very bottom is a waterproofing layer (or membrane) that prevents moisture from slipping into the subroof. Water instead runs into pre-cut drains. Above that layer lies a durable root barrier that (you guessed it) bars roots from delving too deep. Halfway to the top lies the drainage layer, which permits moisture an avenue of escape. This prevents over-saturation in the growing medium which we’ll discuss in a moment. Exact construction may very lightly between companies, but that is the typical design. While green roofs are relatively new to the US, they’ve been increasingly popular in Europe over the last few decades. Their lifespan generally spans between 30 and 50 years. That’s about the length that some premium roofing materials provide, though green roofing installations offer some additional perks (which we’ll discuss later). How Expensive is a Green Roof? Base level costs vary based on which professionals you talk with, but you can expect green roofs to run from $10 to $20 for each square foot of roofing. That range factors in installation and prep costs, as well as materials. When you choose a roofing company to install your green system, make sure to ask what their costing includes. Extensive systems have a smaller layer of growth medium. As a result, they support fewer species of plants. On the other hand, they also require less roofing support and reduced maintenance. Semi-intensive systems provide a larger pool of plant options for your roof. They do not sustain the largest plant varieties, however. Intensive systems come with the steepest load requirements, but they also support a massive variety of plant life. The largest designs, in luxury homes or atop corporate offices even feature trees and large shrubs. Intensive systems need significantly more care, and they cost the most by far. Depending on your local ordinances, your project may qualify for government cost-sharing or tax incentives. You should do a little research beforehand, especially if you are planning for a business. Do Green Roofs Reduce Energy? Green roof systems absorb heat from the surrounding air. They also reduce the overall surface temperature of the roof, which cuts down on interior energy waste. How? With less heat penetrating the roof, your HVAC system won’t have to work as hard conditioning the air. The subsequently shorter run times means slowed part degradation and less energy consumption. Green Roofing is Often Incentivized By Local Government Tax Programs. See What Your Area Has to Offer. It’s a reasonable question. What are the benefits of a green roof? First, there’s the considerable energy benefits you’ll enjoy. Reduced operating time for your HVAC system means lower electricity costs and reduced stress on your air conditioning parts. There’s also the environmental effects. Plants naturally absorb ambient heat and air pollutants to refresh the surrounding area. Because your plants and the underlying growth medium absorb water, a green roof also reduces the amount of rain water spilling around your house (or office building). The long lifespan of theses systems is also very appealing. Beyond all these easily recited benefits is the gorgeous, wholesome beauty of natural plant life. The psychological boon that this provides to homeowners is unquantifiable, but real. You only have to talk to other homeowners with green roofs to see it. Yes, and this grows more noticeable the thicker the growth medium layer is. Both interior heat and cool is preserved as a result. However, there’s a second insulating effect that many homeowners don’t consider: noise reduction. A thick layer of soil absorbs sound from the surrounding area so that less is transmitted into the home. Some Green Roofs Come in Modular Form. This Makes it Easier to Customize Roof Access. 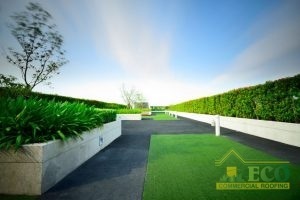 Green roofs provide several environmental and energy savings benefits, you’ll notice that the investment costs are significantly higher than other commercial or residential options. The average cost per square foot of a green roof ($15) is almost double the average of PVC or TPO roofing. Green roofs cost twice as much but can last twice as long. They have better environmental benefits. They provide better waterproofing and storm protection. Ask About a Quote for Your Office Building! Want to learn more about installing a green roof in Texas, Louisiana, and Mississippi, TX or a nearby city? Our team at ECO Commercial Roofing would love to talk with you about it! Give us a call today at (833) 200-0571! Posted in Uncategorized on December 11, 2018 at 10:07 pm by ECO Roofing. What Kind Of Roofs Work Best For Industrial Buildings? Call Us For Industrial Roofing That Looks Great. Industrial buildings aren’t always just big warehouses that get things shipped in and out of them all day. They are often time hospitals and large hotel chains that need good quality roofing to make the people inside as comfortable as possible. While you are having your roof done on a hospital or hotel building, consider looking into American Standard walk-in tubs for your rooms to complete level of comfort for everyone. There are so many different options that you can use for industrial roofing to make sure that your building will last as long as possible. Metal Roofing – Metal is one of the best options to have to make sure that weather and rain do not get inside. You can also count on the fact that your roof will last a long time this way. Flat Roofing – Flat roofs require a little extra attention because they are more prone to damage. Many industrial roofs are flat so you will want to make sure that the material you choose will be able to withstand a little more than usual. 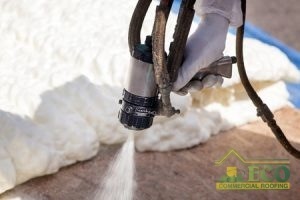 Spray Foam – Spray foam creates a seamless top that will help you seal water out and keep things like dirt from damaging your roof. Single Ply – There are a lot of different single ply materials that are water resistant and some that repel the sun to even help with energy efficiency. If you need an industrial roof in Texas, Louisiana, and Mississippi, TX, give ECO Commercial Roofing a call at (833) 200-0571 for help. Posted in Uncategorized on September 11, 2018 at 8:27 pm by ECO Roofing. If Your Employees Have Noticed Ceiling Stains, Be Sure to Have Your Roof Inspected for Leaks. Let’s face it. Flat roofs are great, but they face several challenges that other sloped roofs don’t have to. One of the biggest is ponding water, or roof leaks. Roofing leaks have a tendency to spiral out of control and create serious roof hazards. It’s not even due to lack of effort on the part of businesses; they’re simply difficult to spot sometimes. Lucky for you, we have some times on how you can protect your commercial roofing system from these pesky problems! Spotting the leak is often a matter of chance, depending on where the leak originates. Some businesses may call their plumbing maintenance service because they think they have a damaged pipe, when the problem originated from rooftop leak that trickled down into the walls. The good news is you can easily take measures to defend against these roofing hazards. Regular roof inspections can help you identify and deal with leaks that have cropped up over time. If scarring, cracks, and small holes have you worried about your rooftop, try using a silicone roof coating to mend the damage and provide an extra layer of waterproofing protection. You can also ask your local commercial roofing company to install better drain paths to combat heavy rains and water pooling. When your business faces invasive roof leaks, take care of it sooner than later. If you’d like more information about spotting and addressing leaks and other roof hazards, give our ECO Commercial Roofing team a call at (833) 200-0571. Posted in Uncategorized on August 7, 2018 at 9:29 pm by ECO Roofing. Your commercial roof is a very important part of your company. When you have a business to run, the last thing you need or want to be dealing with is a roofing problem. A roof coating is something that gets put onto the top of your roof and is used as a protectant against things like water and other weather that can happen over the years. They are typically very simple to put on and easy to repair. Easy Install – When you are getting a new roof the process usually takes some time to have installed. With a roof coating, it is not difficult to install and is usually put on very quickly. It can either be installed using a roller or by being sprayed on. Easy Repair – This goes hand in hand with the installation process as it is very easy to repair. If for whatever reason you need to repair part of the roof, it can easily be reapplied only to that spot and it will blend right in and be as good as new. Protecting – A roof coating can be a great asset to your roof because it can add an additional 7- 12 years to the life of your roof depending on which kind you get. Not only that, but it can stop water damage and also lower your energy bills in some cases because of its ability to deflect the sun’s rays off of it. If you have more questions or want to know what kind of roof coating would work best for your commercial roof, call ECO Commercial Roofing by dialing (833) 200-0571. Posted in Uncategorized on June 1, 2018 at 8:33 pm by ECO Roofing. Copper Roofing Can Endure for Over 100 Years! Metal roofing has exploded in the last few decades! The sheer variety of colors and styles available is enough to make the average consumer’s head spin. It can be hard to settle on a specific metal, so we’ve patched together a short list of favorites. Here are three of our top metal roof systems, plus our reasons for loving them so much. There’s no doubt: steel is a classic. It up to 50 years of protection for homeowners, and it rarely shows signs of aging during that lengthy lifespan. One of the top reasons we love steel however, is the sheer variety of styles and designs available to homeowners. Many consumers don’t realize how light and versatile steel can be. Experienced craftsmen can be folded into sheets or coated with stone for a more traditional aesthetic. With a little paint, aluminum provides a fabulous cover for any style of housing. The metal is highly flexible, allowing roofers to craft a myriad of styles and shapes. Consumers love aluminum because of its incredible reflectivity. Deflected sunlight means lower energy bills, and who doesn’t like lower energy bills? Our favorite perk of aluminum however: aluminum is virtually immune to corrosion. On the beach with salty humidity or in climates with frequent rain and snow, aluminum just refuses to rust. 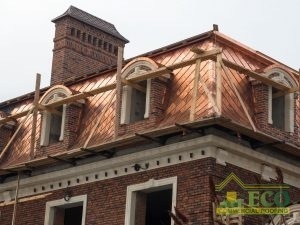 A short disclaimer: copper roofing is considered a premium (expensive) roofing system. Homeowners that get past the initial investment however, enjoy a lifetime of robust protection and corrosion resistance. Our roofers however, love copper for the unique hue it develops over the years. Every copper roofing system develops a different hue of green or blue luster that’s simply beautiful. There you go! These are three of our favorite materials for metal roof systems. If you’d like more information about metal roofing in Texas, Louisiana, and Mississippi, TX, talk to one of our enthusiastic professionals at(833) 200-0571. Posted in Uncategorized on April 27, 2018 at 4:34 pm by ECO Roofing. One of the best ways to add extra curb appeal and value to your home is with quality roofing. Excellent roofing materials have the ability to raise the value of your home while adding extra aesthetic appeal to the appearance of your residence. One of the best roofing systems that can provide both visual appeal and value is slate roofing. Customers who install slate roofs are able to reap many benefits. Find Out How Slate Roofing Can Benefit You. A nice benefit of slate roofing is how durable it is. Our roofing is used to protect us and keep us safe, so it’s essential to have a roof that can withstand inclement weather and the changing of the seasons. As a homeowner, you know how important roof maintenance is, but it can be a pain to schedule. With a slate roof, you only have to worry about roof maintenance once a year. With the proper care and maintenance, a slate roof can last for up to one hundred years or more. Slate roofing will make it possible for a homeowner to never have to replace their roof in their lifetime. Our roofs catching on fire can be a scary experience, but luckily with a slate roof, residential property owners don’t have to worry. Slate is very fire resistant, so when you install this type of roofing material to your roof, you can feel more at ease. If you are interested in a slate roof installation or repair in Texas, Louisiana, and Mississippi, TX, call the roofers at ECO Commercial Roofing today at (833) 200-0571! Posted in Uncategorized on March 26, 2018 at 4:11 pm by ECO Roofing.